The Humph band are the original band of the much loved British trumpeter, broadcaster, comedy host and oddly progressive swing veteran, who sadly died in 2008. In January 2008, Humphrey Lyttelton celebrated sixty years as a bandleader, leading a band which he ranked as one of the very best of his career. It’s hallmark is versatility, reflected in a repertoire which extends from early traditional to modern by way of Ellington and Basie. The band’s range is also shown by the cast-list of artists whom it has accompanied on disc or in special presentations over the years, among them instrumentalists Buck Clayton and Buddy Tate and singers Jimmy Rushing, Big Joe Turner, Marie Knight, Elkie Brooks, Helen Shapiro and Stacey Kent. Perhaps surprising is an appearance on a CD by the esoteric pop group Radiohead. 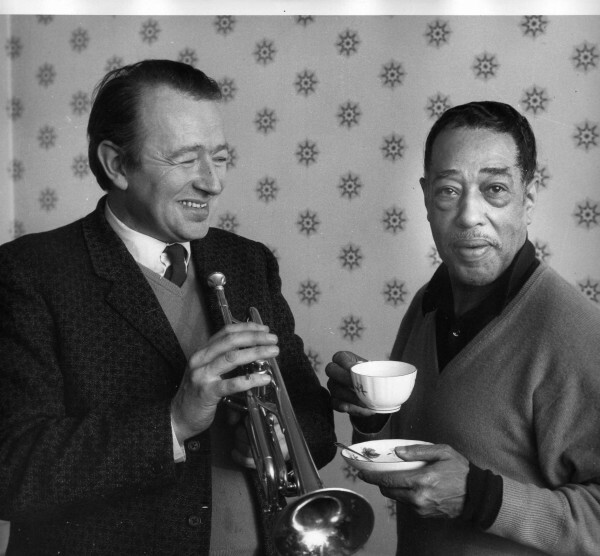 The band has had many distinguished arrangers, including Kenny Graham, Buck Clayton, Eddie Harvey and Pete Strange, whom Humph introduced on-stage as ‘our staff arranger’. Not to be forgotten are Humph’s own compositions, of which he recorded well over two hundred, including ‘the medley of his hit’, Bad Penny Blues. With over 60 years in music, Tony has done it all. Starting as a child prodigy on stage, aged 14 playing Harry James ‘Trumpet Blues’. He then went on to work with almost every band, including the great Ted Heath, becoming the most in demand studio player doing hundreds of recordings and TV shows – Morcambe and Wise, The Two Ronnies and 25 years of the Parkinson Show. Jazzwise, he worked with Tubby Hayes, Johnny Dankworth and the Kenny Clarke/Francy Boland Band. In 1993 he became leader of the Bert Kaempfert Orchestra and was greatly honoured when asked to join the Humphrey Lyttelton Band in 2008 after Humph’s death. Robert began his musical career in Bristol , while he was studying graphic design. Work with a variety of local bands, often sitting in with visiting solo stars of the calibre of Danny Moss and Roy Williams, eventually put the design career on hold when he became a popular attraction in his own right. Over recent years, he has played regularly with the Humphrey Lyttelton band, deputizing variously for Kathy Stobart, Jimmy Hastings and Karen Sharp. After a long wait of almost Gordon Brown proportions and the departure of Karen for fresh pastures, he has become a full-time member, bringing with him enormous experience in bands ranging from the Pasadena Roof Orchestra through the swinging Back to Basie Orchestra to the adventurous Alan Barnes Octet. On whichever instrument he chooses to pick up, he has shown himself a show-stopper! Since then he has become one of the most respected musicians on the British scene, in demand for session work and jazz assignments in top bands. He finally joined the band in the mid-Nineties. Born in Rotherham, by the age of ten Ray was playing trombone with the Rawmarsh Brass Band and, at fourteen, gigging with a local jazz band. It’s little wonder that he turned professional on leaving school and began a career which took him from work with Joe Daniels, Sid Phillips, Ken Mackintosh and other name bands to the Principal Trombone chair in the BBC Radio Orchestra. His route into the Humph band in 2004 took in bands from Freddie Randall to Stan Tracey and studio work has equipped him with a bagful of stellar names from Sinatra downwards. All of which can be summed up in two words – talent and experience. Adrian moved to London from York in 1966 where he became much in demand backing visiting American musicians and working in established British bands. He has been a member of the Humphrey Lyttelton Band since 1982 and he continues to promote Humph’s music and ideals. His interest in small group work came to fruition with the formation of Trio Time, a truly collective group that is continually developing its style and has led to three successful CDs. He is an active member of the Musicians’ Union representing jazz players and since Humph’s death is involved with the Humph Trust. Classically trained as a cellist, John toured and recorded as such with Keith Tippet’s Centipede and subsequently appeared with Yehudi Menuhin and Peter Pears. He moved over to double bass and bass guitar in the late 1970s. A list of those with whom he has worked in jazz and also theatre music would constitute a show-business encyclopaedia. He has also found time to act as visiting teacher of jazz double bass and bass guitar at Eton College. Now, after deputising frequently with Humphrey Lyttelton’s band, he brings his vast experience to it on a permanent basis. Self-taught in his youth, he studied with bassist and teacher Peter Ind. In his own words, he sidled into, rather than burst upon, the London jazz scene. For many years he did gigs with his own trio and with other freelance groups, reaching a point when many top international musicians were happy to have him supporting them. He is also a superb and sensitive accompanist. When he joined the Humph band in early 1995, it was his first-ever job with a regular working band; an extraordinary fact which he puts down to being a ‘late-developer’! Tell us what you think of ‘The Humphrey Lyttelton Band with Guest Compere Barry Cryer - Celebrating Humph’s Music and Humour below..